Born 05.11.1982 in Belgrade, Serbia, he started playing the classical guitar when he was 9 years old. 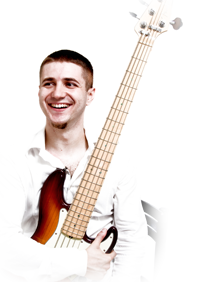 He finished high school for graphic designer and another for bass guitar at "Stankovic" jazz section, under professors Bata Božanić and Predrag Revišin. Collaborated with many bands and famous serbian musicians,such as: Aleksandra Radović, Đorđe Balašević, with Kornelije, Aleksandra and Kristina Kovač, Boris Novković, Nina Badrić, Dado Topić, Tanja Banjanin, Jelena Tomašević, etc. He has played over 700 shows with Funkestra over the period of 2007-2012.